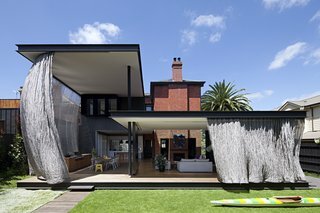 Taking a cue from Japanese architecture, Hiro-En House in Melbourne features a deep veranda shaded by a stainless-steel mesh curtain. 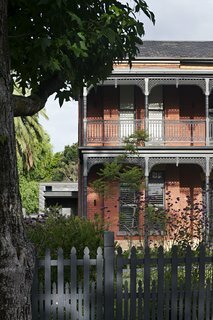 The owners of Hiro-En House, a family of five, approached Australian studio Matt Gibson Architecture + Design to remodel their Victorian-era villa set within a garden in the Barrington heritage area of Melbourne. The award-winning residence draws inspiration from the Japanese architectural concept of "hiro-en," where a deep veranda is established outside a room to mediate interior and exterior spaces. 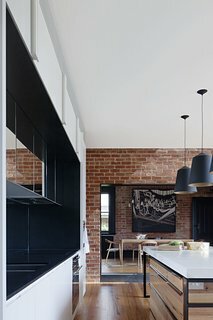 Much of the renovation process involved revealing and exposing the history of the old building, and bringing out echoes of the original construction materials. Gibson opened up the interiors to create an "engawa," an edging strip of non-tatami matted flooring in Japanese architecture, that he then enclosed in a steel mesh curtain. They wanted their new home to better connect with the surrounding garden site, and include a sheltered outdoor space that would allow them to dine comfortably outdoors even in the hot summer months. "The contemporary addition challenges the concept of building low-quality, replica additions that attach themselves to the heritage fabric, and in effect compromise, confuse, and diminish the integrity of the original building," says lead architect Gibson. "We used a contemporary and interactive intervention instead to activate and open up the compartmentalized interior to the previously under-utilized green space." 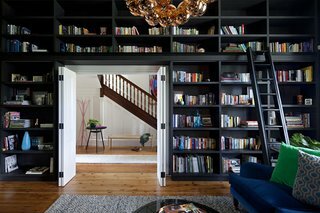 The new layout maximizes the utility of the home's 4,100 square feet. 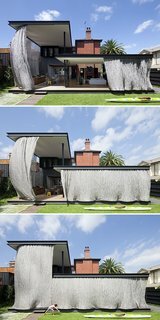 "The sculptural nature of the curtain provides a free flowing and kinetic foil to the permanence and solidity of the heritage structure," says Gibson. "A functional device at its core, it provides an invigorating spatial blurring—layering and overlapping notions of interior and exterior." 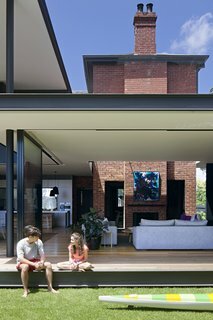 The deep veranda, where a living lounge and outdoor dining area are located, reduces the amount of direct sunlight entering the house, which helps protect the fit-outs, furniture, and fabrics from weathering in the strong Australian sun. 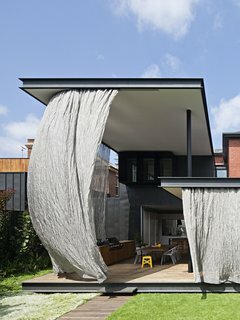 The northern and western perimeters of the hiro-en-style deck are completely enveloped by the steel mesh curtain, which also serves as a rain screen and sun shade. 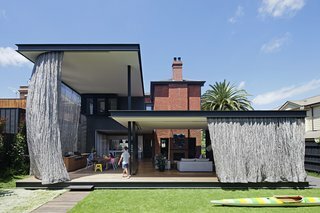 Using computer modeling of sunlight and shadow, Gibson developed a series of canopies of various heights, and designed extensions in a way that would allow them to house an external, stainless-steel mesh curtain. 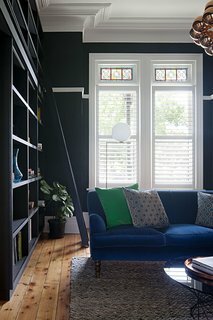 The curtains allow the veranda to admit sunlight from the north, yet filter out heat and glare from the stronger sunlight entering from the west. Aspects of the original building were left exposed. "Spaces and eras are distinguishable yet able to bleed into each other allowing subtle connectivity. Each space, whilst unique, continues a dialogue that is integral to the story of the whole," says Gibson. 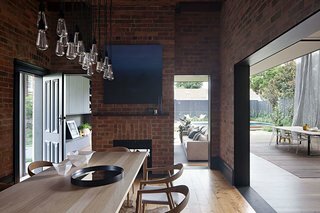 The architects removed a non-original addition on the existing property, and rearranged the existing rooms to create a more flexible layout. 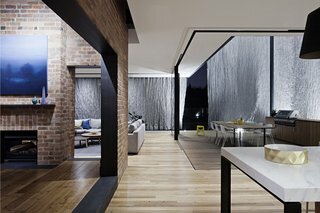 "Through its translucency, the curtain offers a counterpoint of exposure or enclosure depending on how light falls on it, enabling alternate diurnal qualities," says Gibson.